396 people in our community are currently praying with you. A great German organist (Karl Richter) playing a great German composition (Toccata and Fugue in D minor) by another pretty decent German organist (J.S. Bach), and on an antique German organ (in the Basilica of Ottobeuren Abbey - see photo above) to boot. Großer Gott! The presence of hope in the invincible sovereignty of God drives out fear. Then Adonai said to Moshe, “Go to Pharaoh, and tell him, ‘Here is what Adonai, the God of the Hebrews, says: “Let my people go, so that they can worship me. If you refuse to let them go and persist in holding on to them, the hand of Adonai is on your livestock in the field — on the horses, donkeys, camels, cattle and flocks — and will make them suffer a devastating illness. Adonai determined the exact time by saying, “Tomorrow Adonai will do this in the land.” The following day, Adonai did it — all the livestock of Egypt died; but not one of the animals belonging to the people of Isra’el died. 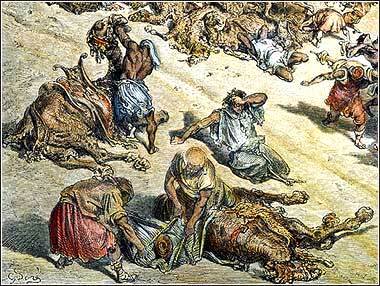 Pharaoh investigated and found that not even one of the animals of the people of Isra’el had died. Nevertheless, Pharaoh’s heart remained stubborn, and he didn’t let the people go. The plagues against Egypt are both integrated and progressive, and the fifth plague represents a major escalation in several aspects. It is a plague of death. The first four were irritating occurrences, burdensome and disruptive, but the widespread death of Egyptian livestock constitutes serious and permanent economic loss. The role of cattle, sheep and goats in a primitive agricultural economy is enormous: they are a major source of food, a major means of transportation, and the source of raw materials. They are used as a source of power, especially to plow fields. And the damage does not end when the plague lifts, for the livestock is gone until they can be repopulated. Most of all, though, is the fact that YHWH is causing death; it is an ominous development. There are more subtle differences in this plague, as well. This is the first time Moses has attributed a plague directly to "the hand of God". It clarifies that the dispute is not between Pharaoh and the Hebrews, but between Pharaoh and God Himself. In the same vein, the phrase "persist in holding onto them", sometimes translated as "holding them back," emphasizes how Pharaoh misunderstands what is going on. From the Egyptian point of view, this is a matter of slaves wanting their freedom, a dispute between a conquering and a subjugated people. But in fact, the Hebrew inhabitance of Canaan is destiny, the will of the one true God. Pharaoh is not trying to maintain the status quo, as he thinks; rather, he is standing athwart a divine plan.